1. PRE-HEAT oven to 350˚. COMBINE broccoli and water in 10-inch, oven-proof nonstick skillet. COOK over medium heat until tender, stirring occasionally, about 5 minutes. DRAIN well. 2. BEAT eggs, milk, mustard, salt and pepper in large bowl until blended. ADD broccoli mixture, cheese and green onion; MIX well. 3. COAT same skillet with cooking spray and HEAT over medium heat until hot. POUR egg mixture into skillet and COOK over low to medium heat until edges are set, about 5 minutes. 4. REMOVE from burner and TRANSFER to oven. BAKE until eggs are completely set and no visible liquid egg remains, about 10 minutes. REMOVE from oven and let sit for 5 minutes. CUT into wedges and SERVE. 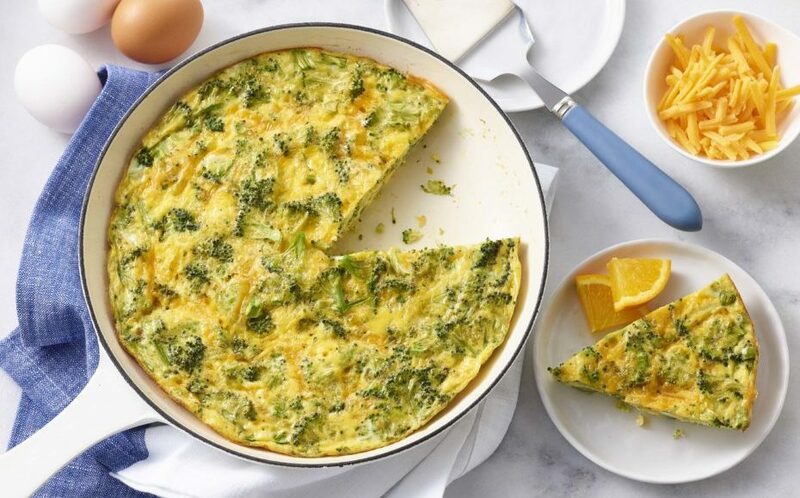 • For an impressive presentation, invert frittata onto a plate to show it’s nicely browned bottom. • For a quick dinner, add slices of chopped ham or chicken. This recipe is an excellent source of protein, vitamin A, folate and choline and a good source of vitamin D.